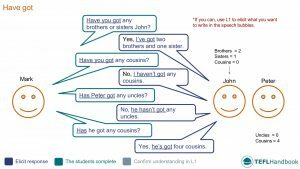 A collection of English teaching resources that you can use to teach using have and have got to beginners. This ESL lesson plan contains a lead-in activity, three classroom activities, one game and a list of further ESL resources from around the web. The best way to view this content is through the TEFL Handbook app. So if you have an Android or iOS device, be sure to check it out. Start by drawing the three characters on the board and adding the family information for John and Peter. Then tell the students that Mark wants to know this information and is going to ask Peter and John some questions. Finally, step through the dialogue, highlighting the use of 'have got' in each case. Depending on the age/level of the class, you may even want to prepare a drill that covers the conjugations of the verb. The students have to answer 'have got' style questions about their family. 1. Have you got any brothers or sisters? 2. Have you got any uncles? 3. Have you got any cousins? Next, inform the students that they are going to answer each question. Point to the examples on the sample board work if you have used it. 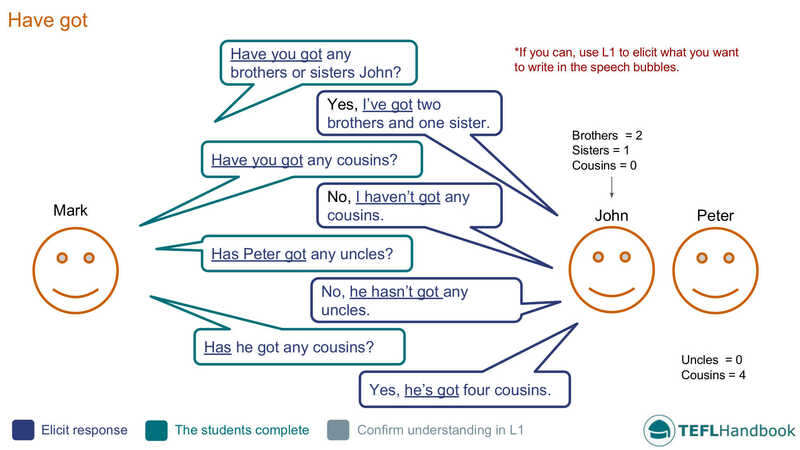 A follow-on speaking activity where students ask and answer the 'have got' style questions from the previous exercise. In pairs and using the answers from the last exercise, students practise asking each other the 'have got' style questions from the board. Encourage fast finishers to invent new ones by switching the object to something else. Students will ask each other 'have got' style questions that are a mix of singular and plural constructions. Have you got a skateboard? Have you got any Aunties? Finally, the students must interview each other using the above prompts. Have them ask three have got style questions to a partner, then three to other people in the class. We have one ESL game for teaching have got to beginners. As usual, our suggestions require the minimum of resources (whiteboard, markers and some students). What have I got in my bag? Students have to guess what possessions are in their classmates' schoolbags. Student A: Have you got a rubber? Student B: No, I haven’t. Student A: Have you got a ruler? Go around the room until everyone has had a turn. If you're teaching children and your classroom has access to a projector, we recommend playing the have got grammar games on The British Council's Learn English Kids website. For some more ESL game ideas, check out 7 Have/Have Got Games For Young Learners at tefl.net. A couple of these require a little preparation, but we think they're worth the effort. iSLCOLLECTIVE has a great selection of worksheets that can be used to revise have and have got. Select one that best suits the age and level of your class. We think the Monster's Body Parts worksheet provides an excellent opportunity for students to practice body part vocabulary along with some of the language learned in this lesson. If you've found these ideas useful, be sure to check out our complete list of ESL lesson plans for beginners (A1 Mid-level), as well as our entire collection of ESL lesson plans. Our suggested next lesson is on how to describe animals. Also, Android and iOS users can access all of our materials through the TEFL Handbook app. An ESL lesson planner for English teachers.